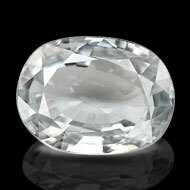 White zircon has been traditionally used as a 'substitute' for the far more expensive diamond for hundreds of years. 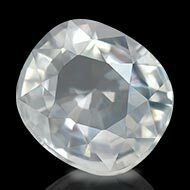 It's very similar it's only slightly less hard (Mohs hardness of about 7.5), and it has a similar lustre and refractive index. It also has the brilliant sheen that the diamond is so famous for. However it is a gemstone of Planet Uranus and work on Crown Chakra unlike diamond that is a Gemstone of Planet Venus and works on heart chakra. 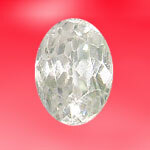 However, in contemporary gemology, white zircon has been gaining importance in its own right. It's found in several other colours as well brown, yellow and orange being the most notable shades. Zircon is basically zircon silicate. The mineral is found universally, and in all types of rocks. 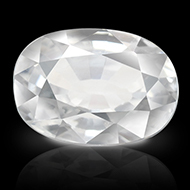 Its typical tetragonal structure leads to the white brilliance that is associated with the stone. The mineral is frequently used in the ceramic industry. Also, traces of radioactive elements like thorium and uranium found in zircon deposits have contributed to the development of radioactive dating. The benefits and healing properties of white zircon are numerous. 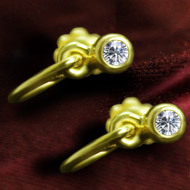 It can be worn as ring or bracelet or pendant. It's use with silver ornaments is famous. 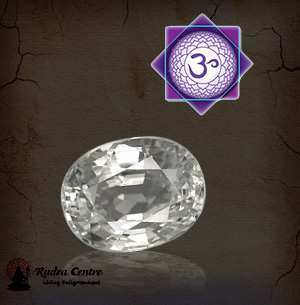 This stone helps unblock the Sahasrara Chakra known as the central crown chakra. This node of our body decides the awareness of our existence. When blocked, it leads to lack of enthusiasm in life and fears of death and bad luck. This stone helps enhance the wearer's memory, and prevents headaches, migraines and mental wearing from old age. Numerous countries; but Australia and Africa are the biggest producers.